I’ve been spring cleaning the past week and have made a lot of progress. I still have a lot to clean, though! It’s amazing how quickly the house gets messy if I don’t stay on top of it. Eventually we’ll obtain bookcases and that will eliminate a lot of the clutter. But for now, I’m trying to find ways to organize without letting things pile up all over the house. Last week I cleaned up the wet bar next to the fireplace. 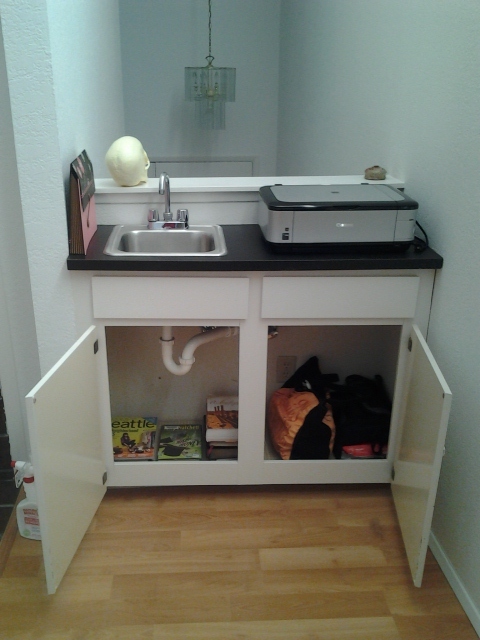 We don’t use the sink there but we do use all of the counter space. 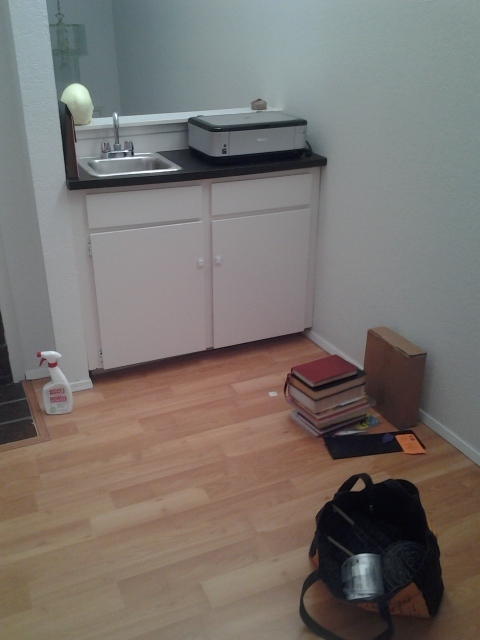 Previously, the counter was covered with various books and quilting supplies. It wasn’t organized in the slightest. I moved all of the books downstairs into our spare bedroom (future study) and put all of my quilting supplies with the other fabric in our closet. I moved all of the DVDs and the Wii games to the newly emptied shelf instead of letting them stack up on the floor underneath the tv. We don’t have an entertainment center yet so the Blu-ray player, Wii, and internet box are sitting on the floor. The games and movies used to sit next to them but now they are nicely lined up on the counter. It looks a lot better! These goals are in addition to my normal cleaning schedule and should keep me busy! I look forward to making our house ever more homey. Tomorrow’s cleaning – the shower and toilet in the downstairs bath. I am so happy that I have a checklist now. I love lists. Next week I will have a printed list for each day and that will provide its own incentive, getting to check things off the list. As it turns out, I had nothing due back at the library but I was dying to go regardless. So, come 2:30 this afternoon, I finished my cleaning, took a shower, and then hopped in the car. Library, here I come! When I left for the library, I had 66 items checked out and took a bag of books with me to return. Now that I’m home again, I have 76 items checked out. Oops. That number is supposed to be going down, not up! I spent an hour browsing the shelves, mostly in the quilting section. I am looking for inspiration for my brother’s new baby (due in December). Of course, Bruno demanded that he be included in the photo. 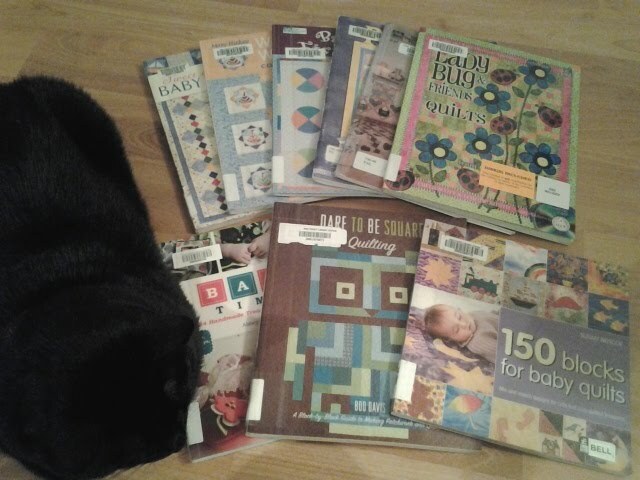 I tried to explain to him that they were just books about quilts, not actual quilts, but he insisted. 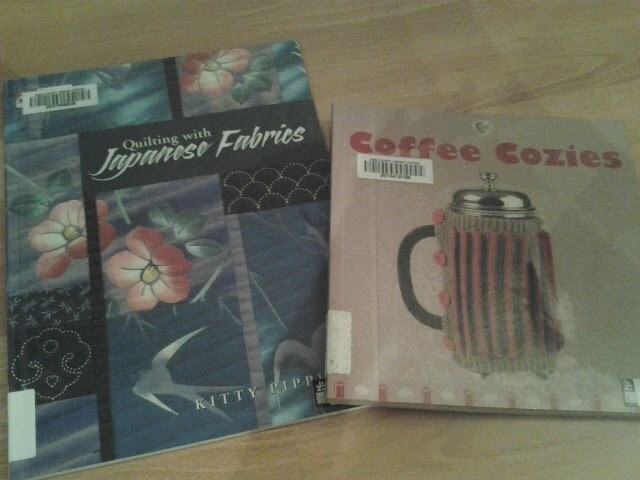 And two of the books I checked out just for me. My husband was shocked that I dared suggest that I desecrate his precious French press with YARN but finally acquiesed and I said I could knit him a coffee cozy. 😉 Ah, true love. Today was much quieter as far as my husband’s phone was concerned. That made it easier for me to work as needed. In addition to this, I kept the kitchen clean, ran a load of laundry, and swept the entire upstairs floor. It’s looking better in here every day! I still need to deal with the piles of papers, though… those piles are the only thing keeping our upstairs from looking tidy. I did not accomplish exactly what I had planned on accomplishing. My husband was just handed a huge project for work and spent most of the day on the phone. I did manage to keep the kitchen clean, tidy the living room, wash some laundry, and reorganize a bit. Until this morning, this counter was covered in piles of library books, mail, and my knitting projects. It was a mess! I took all of the library books downstairs and moved the printer off the floor. However, I still had several piles that I couldn’t figure out what to do with. 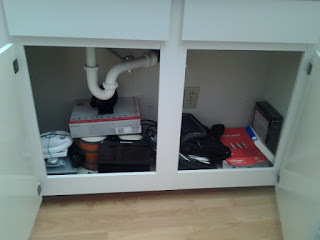 This is what was underneath that counter. Some adaptor for the cable television we have no possible way to actually watch (but is free with our internet service). 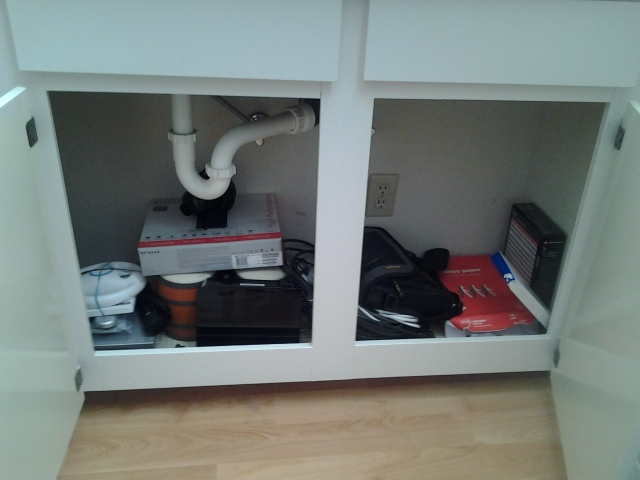 The Wii, plus all the accessories that go along with it. All stuff that we won’t be able to use until we buy a television. I moved all of that downstairs into our spare bedroom. Here is the result – a couple library books, my knitting, and printer paper. All things that are actually being used in our day to day life. And here is our current living room. Sparse, isn’t it? Our bed is propped up against the wall so that the cats don’t jump on it while the sheets are in the wash. Over the fireplace, I taped a print of one of my favorite paintings. It brightens the room a bit, I think. The only thing I wasn’t able to do today was to clean the floors. I am supposed to sweep every day because the cats track their litter, fluff hair all over the place, and normal dust accumulates. It’s disgusting what I sweep up every day but I guess that would normally be hidden in the carpet. Then on Tuesdays, I want to dry mop the upstairs floors. I will have to add that on to tomorrow’s list! On the schedule for Wednesday – clean the upstairs bathroom and our pantry (the closet in the hallway). After yesterday’s rather honest confession, I decided that it would be best to try to remedy some of my procrastination/laziness/lack of motivation. It was hard. But I pushed myself and was able to complete all of my housework. Next week I want to add scrubbing the fridge drawers and shelves to my Monday Cleaning. In addition to this, I swept the entire upstairs and cleaned out the cat boxes. I even washed, dried, and put away all the dishes after dinner! For me, that is a huge accomplishment. My cleaning is usually finished by lunch. In the afternoon, I study Japanese, read books, read blogs, and knit. Here is today’s knitting progress. I finished the second skein of yarn on my dad’s scarf. He wants all three included! The scarf is already almost as tall as I am, about 63 inches so far. Tomorrow I’ll be starting the third skein. I hope to have the scarf completed by the end of the month so that I can start working on Christmas presents. And tomorrow I tackle the living room! Every day I’m trying to do something to prepare for our move. We plan on eliminating enough of our belongings that we can pack everything in the car, plus ship a couple of boxes of books, and make the drive. We don’t own any nice furniture and it would be more expensive to rent a U-haul than it would be to replace the things we own. Today I sold half of our board game collection. We may whittle down our collection further, but I’m not sure we can without getting rid of games we love and play! Also, we threw out our extra mattress. 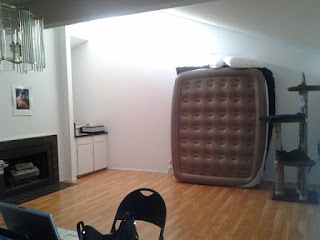 When my dad bought us our futon, we took the one remaining mattress from our old bed and stored it in our spare bedroom. Whenever we had overnight guests, mostly my brother and his wife, they would sleep on the extra mattress. It’s not a full bed, but it’s the best we had. Now that my brother lives across the country, we don’t expect any overnight guests before moving. With the mattress gone, the spare bedroom looks a lot bigger! 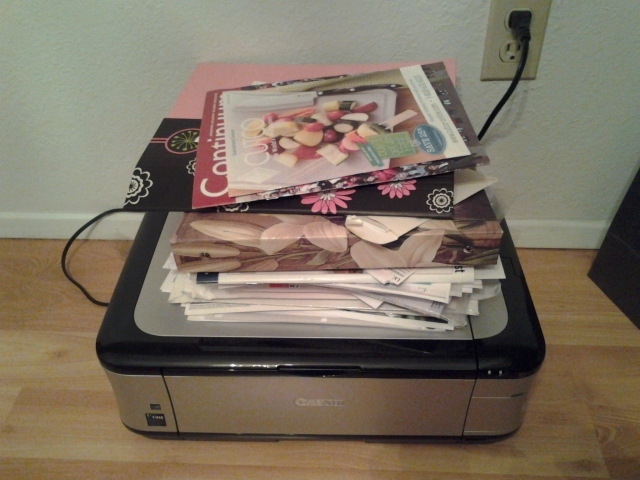 Tomorrow I think I will start scanning some of my files. I’ve been wanting to convert to a paperless system for several years but haven’t made the effort to scan old tax files and other important records. My file box won’t fit in the car so it’s a great time to become paperless! I’ve been feeling contemplative all this week but haven’t yet felt like I could share online. I’m slowly figuring out what is most important to me and reorganize my time around those priorities. One change I’ve made this week involves my weekly room assignments. I designate one weekday to each room in our house. That’s where I will concentrate my housekeeping efforts on that day, though the entire apartment will get a quick pick up/vacuum almost every day. 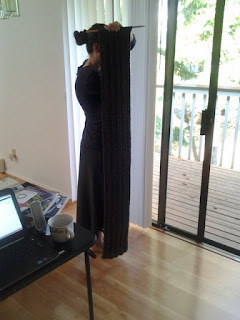 Fridays are always busy because I’m prepping for the Sabbath, making sure we have church clothes, a meal for Sabbath afternoon, a tidy house, and that all has to be complete by sundown. Come sundown, my work week is over and I’m ready for the Sabbath. Prior to this week, I would clean the bathroom on Friday. While it’s not labor intensive, it does take time to thoroughly clean the mirrors, sink, toilet, floor, and shower. Cleaning the bathroom, on top of my normal Friday activities, always seemed so hectic. This week, I decided to clean the bathroom on Thursday. Wow! That made a huge difference on how rushed I felt today. I was able to take my time with each chore, cook, clean out the fridge, wash and put away the laundry, and tidy the apartment. It was such a nice change, one that I will definitely be making permanent. I hope everyone has a fantastic weekend! I’m off to tend to our supper and relax. Hubby informed me last night that he’d be out all day today. Normally, he’s home working all or part of the day so this was unusual. I decided to embrace the quiet house and get a ton of stuff done. I promised hubby that he’d be impressed by my productivity when he got home. I think I succeeded, though he’s not home yet to confirm. Whew. 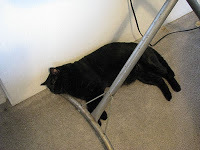 And since hubby is still not home, I’m writing a blog post. I love productive days! Once I’m done with this post, I’ll either spend some more time with my Japanese studies or keep working on my quilt. Hubby is working way up north today so when he calls to tell me he’s on the way, I’ll still have enough time to prepare dinner. 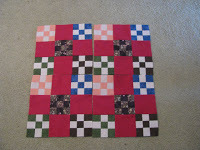 8 more D9P blocks to sew together. 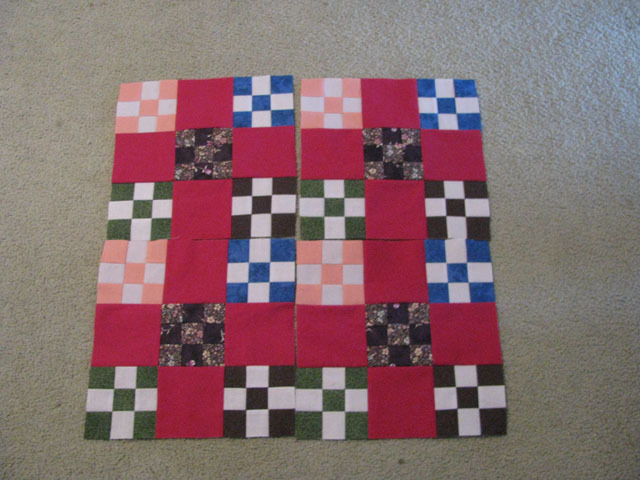 There will be 12″ solid blocks of the dark pink fabric between each of these D9P blocks. I haven’t cut those out yet, so I can’t show what it will look like. This is a new pattern for me and I think I like it. I’m not sure about all the fabric choices, but the pattern is fun. Here’s to a day of great productivity!